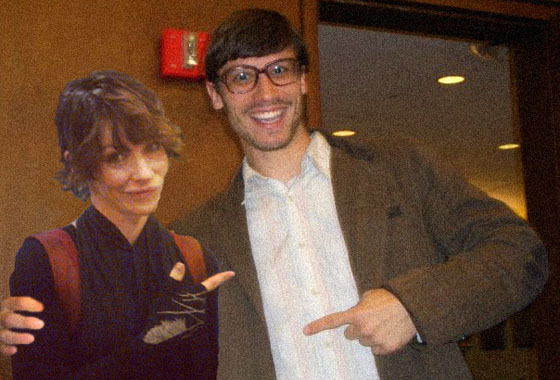 Some very pathetic Photoshoping of Evangeline Lilly into my “Revenge of the Nerd” photo series. And it is quite fitting she should win considering that she, of all the contestants, has been the most engaged with the contest and had some odd little interactions and influence on me over the course of the past few weeks. Although I did not have strong expectations for her at the beginning of the tournament, the more I learned about Evangeline, the more I began to root for her. Those two facts immediately put her on my radar and on “the tournament list.” But, she didn’t make the initial cut to top 64 simply because she was “too famous.” She was a major star in one of the most popular television shows of the last decade as well as a star opposite Hugh Jackman in a major big budget film (Real Steel). But, several contestants were disqualified from the competition for one reason or another and that gave me an excuse to bump Evangeline up the list and into the competition. Grossly underestimating what my friends would prefer or not prefer, I ranked her #16 in her conference and assumed she would be eliminated early. Of course, she proved me wrong – and proved why I made the Girlfriend Bracket in the first place. The idea behind the competition is that “people on the outside” have very different perspectives – often a clearer view – than those who are “too close” to the action. So, it is possible that people observing two individuals and know one or both of them fairly well will have different ideas (and possibly better ideas) about who would make a better match. Well, my friends who voted certainly had a different perspective than I did, elevating a #16 seed to become champion! As the competition went on, and as she began to win match-ups (to my surprise), I began to do a little bit more research about Evangeline. It also peeked my interest that out of the 50+ contestants who were receiving tweets notifying them of their match-ups, Evangeline was the most engaged in re-tweeting or responding. I soon learned that despite her “elevated” status as a celebrity, Evangeline is extremely down to earth and much more engaged with her fans than the typical celebrity. She is also extremely – and I can’t emphasize “extremely” enough – passionate about making the world a better place through activism. I learned from her Facebook and Twitter that she was very active in opposing government infringement on civil liberties and helping educate her fans about opposing CISPA. I posted a few comments on one of her anti-CISPA Facebook posts with some suggestions about how to contact your congressman regarding pending legislation (which she promptly acknowledged and re-posted on her page – damn that girl is passionate about opposing CISPA!). A few weeks ago, Evangeline traveled to Colorado to speak at the National Conference for Media Reform. Of course, this is an issue I am extremely – and I can’t emphasize “extremely” enough – passionate about. I was very moved by her speech. As a bonus, I am embedding the video of her speech at the end of this post. She also began sharing some very intriguing quotes from the book she is currently reading. I found them so intriguing that I picked up a copy of book myself and am now quite deeply engrossed in A Fraction of the Whole by Steve Toltz. I highly recommend this book to everyone I know. It is extremely fascinating. And I recommend following Evangeline’s tweets and pending book discussion under #AFOTWwEL. And so, it all too ironic that the one contestant in the Girlfriend Bracket with whom I have interacted (for what little it has been and for what little it is worth) during the tournament has gone on to win the tournament by the popular vote of my friends and family. And so, Evangeline Lilly has won the 2013 Girlfriend Bracket. And I am sure that she will make an excellent (fake) girlfriend until that day comes when she grows tired of our (fake) relationship and (fake) dumps me. And, Evangeline, here’s what you’ve won! (1) A (fake) relationship with our bachelor, Zachariah Wiedeman (psst! that’s me!) for as long as is appropriate. (4) The new found (real) admiration and respect of my friends, family, and infrequent fans/followers. And of course, the flattering validation that goes along with that having been voted Champion by a 38 point margin. (5) A lifetime of (real) happy memories for having participated in this fun and exciting event that brought a smile to everyone’s face who voted and participated. (7) And a FREE (real) dinner with the bachelor (psst! again, that’s me!) at RoSal’s Italian Cucina in Little Italy, Chicago (Chicago’s best Italian food). OR, if Italian isn’t your thing, I’m sure a suitable substitute restaurant can be arranged (travel to and from Chicago not included). Please contact the me directly (@wiedepedia) to make arrangements and set a date. A minimum of one week advanced notice is appreciated. Now, enjoy Evangeline’s most interesting speech from the NCMR! This entry was posted in Blog, Girlfriend Bracket by Zachariah Wiedeman.